Hosts India beat Kenya's Harambee Stars 3-0 in their second match of the 2018 Intercontinental match played at a sold out Mumbai Football Arena in Mumbai India on Monday 4th June. India who are ranked higher than Kenya in FIFA rankings were the favorites to win the tie but had to wait until the second half to find a breakthrough. The heavy down pour impeded flow of the game especially in the first half that ended 0-0. A foul on Sunil Chhetri by Mike Kibwage inside the box earned India a penalty that Sunil converted to send the partisan crown into frenzy in the 65th minute. Five minutes later Jeje Lalpekhlua was presented with an opportunity following a poor clearance that he capitalized on well to make it 2-0 for India. An extra time counter attack left Chhetri with an easy job to beat keeper Patrick Matasi to mark his 100th cap for India with a brace. The Harambee Stars side that is missing Gor Mahia and AFC Leopards players will be against Chinese Taipei on Friday 8th June, 2018.Kenya must beat Chinese Taipei and hope New Zealand falters in order to setup a final match against the home side India who are using the tournament to prepare for to prepare for 2019 AFC Asian Cup. 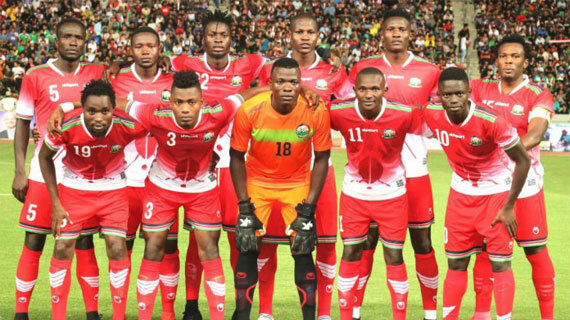 Harambee Stars Starting XI : Patrick Matasi (GK), Jockins Atudo, Bolton Omwenga (John Makwatta 70’), Mike Kibwage, Musa Mohammed, Dennis Odhiambo, Patilah Omotto, Duncan Otieno, Cliffton Miheso, Ovella Ochieng, Pistone Mutamba. Substitutes : Timothy Odhiambo (GK), , Bernard Ochieng, Eric Ouma, Johnstone Omurwa, Vincent Wasambo, Chrispin Oduor, Kenneth Muguna, Timothy Otieno.